Veterans Day is November 11th and is a time for all of us to pay tribute to the men and women that have served our country. Make plans now to reach out to veterans and offer them the opportunity to continue to make a difference and change lives in their community. The Involve a U.S. Veteran program waives the charter or entrance fee for any qualifying veteran who joins a new or existing Lions club. Eligible veterans include retired U.S. military personnel or honorably-discharged members of the Air Force, Army, Coast Guard Services, Marines, National Guard, Navy or Reserves. Those currently serving in the National Guard or Reserves are also eligible. This special pilot program is offered only in the United States. Houston Cy-Fair Lions Club, in conjunction with several Scout Troops in the area, provide over 50 overflowing bushel baskets of food, including a turkey and all the holiday trimmings, for needy families within the Houston Cy-Fair area. Scouts conduct food drives, and Lions Club members, Scouts, and friends deliver the baskets to the families, usually the Saturday prior to Christmas. Houston Cy-Fair Lions Club sponsors many physically challenged and Type 1 Diabetic children to the Texas Lions Camp in Kerrville. This fully accredited Camp provides these special needs children with all the fun and excitement of a week at summer camp. We invite the Campers and their families to attend a meeting in September, to share with us what they did at Camp. This is always a highlight of our year. 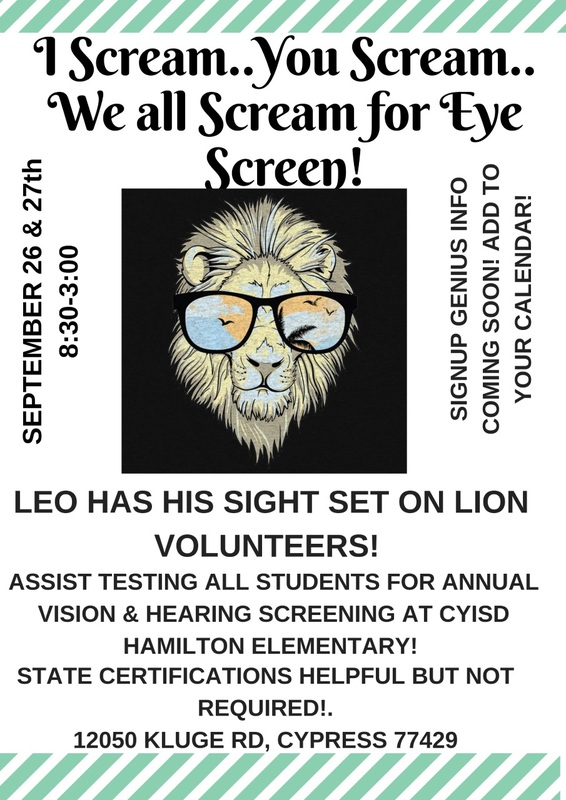 Houston Cy-Fair Lions Club is committed to promoting and saving vision. Some vision problems, if not caught and treated early, can lead to permanent blindness. Typical vision screening normally starts when a child enters school, where a child reads from a chart 10 feet away and only checks for the ability to see far away. We use a special camera by Plusoptix, which takes a picture of the child’s eyes, and within 30 seconds, and can detect vision problems including nearsightedness, farsightedness, astigmatism, unequal pupil size, “lazy eye”, and other problems. With this device, we can easily and successfully screen children from six months of age and older. Children with vision problems are not aware that they cannot see well, as they cannot compare their vision to others. Vision problems in children do not cause pain or inflammation, so parents and teachers are not aware that there is a problem. The Plusoptix Vision Screener gives us a message of PASS or REFER immediately at the screening. Children who are referred should be seen by a professional for a complete vision examination. Houston Cy-Fair Lions Club sends physically challenged children and those with Type 1 Diabetes to our very own Texas Lions Camp, set in over 500 acres in beautiful Kerrville, Tx. Children spend a week at Camp, doing what kids do best, just being kids and having fun and learning new exciting things, at no cost to the families. Houston Cy-Fair Lions Club has purchased a Low Vision Screener for a local family with four persons with very low vision. This device enlarges ordinary type so that books, magazines, etc. can be read at home.